A blurry image is a no-go for every real estate photo. Anyone who seriously takes photos of real estate should therefore use a remote control. In low light situations, like often found indoors, long time exposures are needed. To create clear images, the camera must always stand absolutely still when released. Even touching the release button by hand causes unwanted camera shake that can ruin a photo. Therefore, it makes sense to trigger the camera contact-free, even if it sits on a tripod. Depending on the camera type, there are different accessories that help to create an image without touching the camera when shooting. With these little helpers, you can achieve a stunning improvement in image quality for a small price. At the end of this post you will find some product recommendations for real estate photography. The simplest option is the built-in camera self-timer. 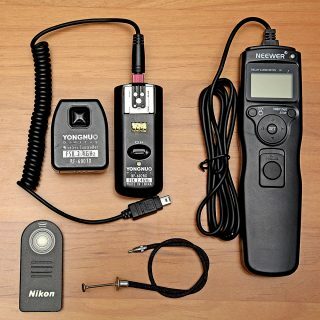 If you press the shutter-release button for the photo, the camera will be released after a certain period of time (this time is actually meant for the photographer to get himself into the frame). During this period, a possible camera shake may settle. On some camera models you need to re-enable the self-timer mode for each shot, which is a annoying when taking continuous shots. For all others, do not forget to turn it off after taking a picture series. Therefore, the following accessory variants are more preferable. Larger cameras – from the lower middle class – have an accessory port to which you can connect various electrical devices. A simple cable remote control can be connected to this camera port. Each camera manufacturer and often also each camera class has its own connector shape, so that the right option must be considered when purchasing. The release often consists of a handle with a two-stage release button. 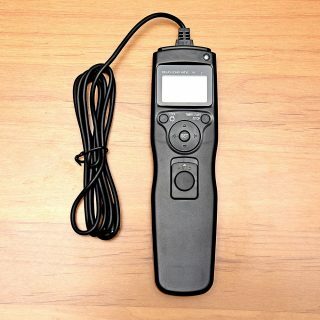 Once you press it halfway, the autofocus and light meter of the camera are activated and the camera focuses on the subject and measures for the correct exposure settings. If you press it completely, the camera shutter will be triggered. When the connecting cable hangs loose, no triggering movements of the photographer will be transferred to the camera. You are however limited to the maximum cable length when recording. Some cameras have infrared sensors that detect release signals from an IR trigger when activated. 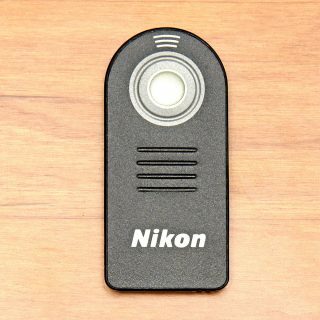 An infrared shutter release is the most space-saving version and fits into any pocket. It also works in a two-step mode – first the autofocus and then take the picture. However, there must be a line of sight between the camera’s IR sensor and the shutter release, the distance should not exceed 5 meters. The release requires a small battery for the IR signal. A radio remote control works even more comfortably. It consists of a transmitter and a receiver. 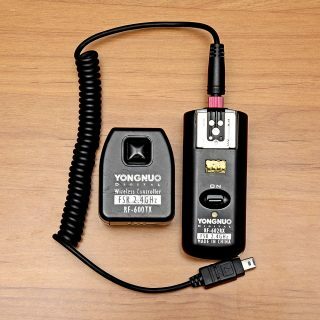 The transmitter is transmitter equipped with a two-stage release button and the receiver is cable-connected to the camera via the accessory port. A line-of-sight connection is not essential, some models can work on a distance of up to 100 meters outdoors and often work in buildings through up to two walls. This variant is interesting, for example, when space is very tight and the photographer might be in the frame. I immediately remember the small bathroom where the photographer can always be seen in the mirror. So you can set up the camera, shut the door and can easily trigger the camera wirelessly from the outside. Transmitter and receiver are battery operated. There are variants for almost every camera model. In addition, some of these wireless remote controls have a double benefit: they can work the other way around for the synchronous release of flash units that are not mounted on the camera. 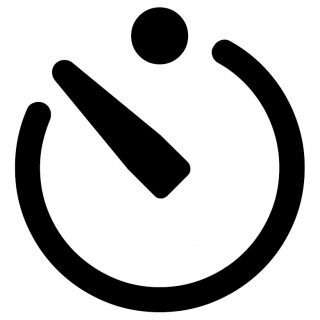 The most powerful variant is the so-called remote timer. It is available in both, cable and wireless versions. They have a display that can execute automated and time-programmed continuous and long-term exposures without having to operate the camera. On request, the autofocus can be activated here before the programmed exposure is started. They are battery operated. But in addition, most cable timers work without any batteries inserted, just like a regular cable remote control (but the programming function will be disabled). For the sake of completeness, I also mention the classic cable release at this point. It existed from the beginning of photography and works completely mechanically. A flexible steel wire runs in a flexible pipe. At one end of the pipe, a thread is attached, which can be screwed into the release button of old cameras (and very few current models). 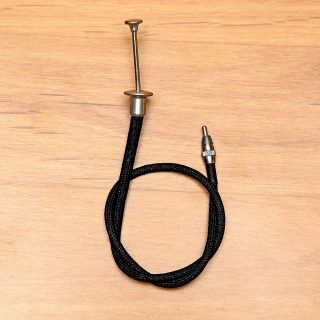 The inner wire can push the trigger down through an opening in the thread. At the other end of the wire there is often a small thumb plate in order to operate the shutter remotely with enough sensitivity. For effective and functional real estate photography, I recommend the use of either the infrared or the radio remote control to the participants in my photo workshops. Purchase recommendations for some models can be found next. The links lead to detailed information on Amazon.